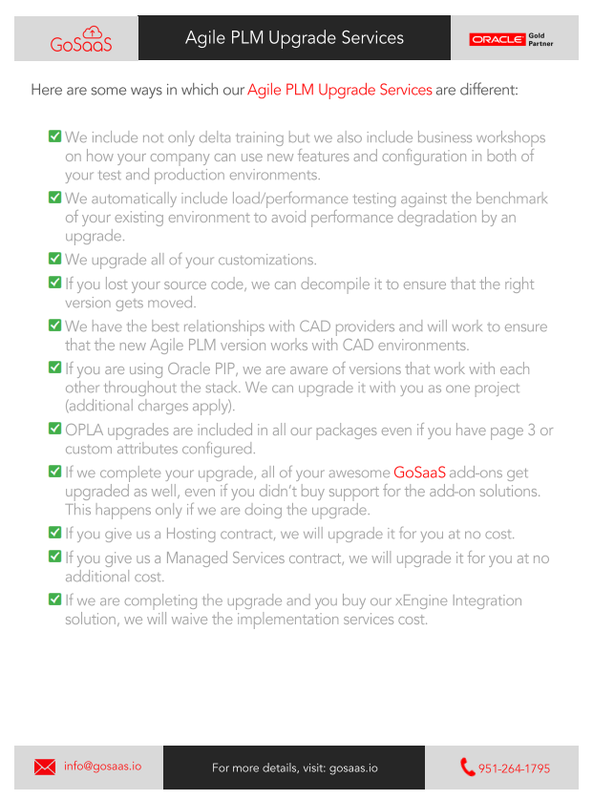 Simplify your Agile PLM upgrade process using the unique and custom methodology built by GoSaaS. For pricing options, contact GoSaaS today! We include not only delta training but we also include business workshops on how your company can use new features and configuration in both of your test and production environments. We automatically include load/performance testing against the benchmark of your existing environment to avoid performance degradation by an upgrade. We upgrade all of your customizations. If you lost your source code, we can decompile it to ensure that the right version gets moved. We have the best relationships with CAD providers and will work to ensure that the new Agile PLM version works with CAD environments. If you are using Oracle PIP, we are aware of versions that work with each other throughout the stack. We can upgrade it with you as one project (additional charges apply). OPLA upgrades are included in all our packages even if you have page 3 or custom attributes configured. 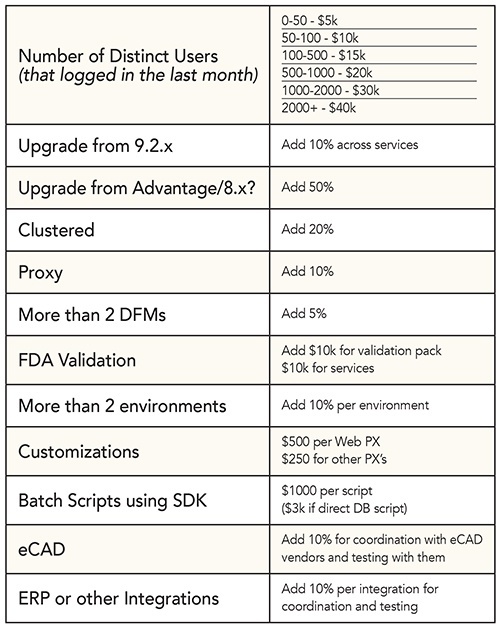 If we complete your upgrade, all of your awesome GoSaaS add-ons get upgraded as well, even if you didn’t buy support for the add-on solutions. This happens only if we are doing the upgrade. If you give us a Hosting contract, we will upgrade it for you at no cost. If you give us a Managed Services contract, we will upgrade it for you at no additional cost. If we are completing the upgrade and you buy our xEngine Integration solution, we will waive the implementation services cost.